I’m cold. My hands are cold, my toes are cold and my nose is cold. Having been toasting nicely in Indianapolis for a few days where the temperatures stayed in the mid 80s, the current Seattle high of 70’ has me huddled indoors in warm clothes. I realize its all relative, but I have to acknowledge that our summer days are numbered. The garden is in its final hurrah with coneflowers (Echinacea), black eyed Susan’s (Rudbeckia) and ornamental grasses dominating the plant palette and the container gardens are pushing out their last reserves with a blast of color from begonia ‘Bonfire’, trailing geraniums (Black magic has been a favorite this year) and jewel toned million bells (Calibrachoa). However, a good friend recently reminded me of another late season star which is under utilized – the hardy hibiscus (Hibiscus syriacus). 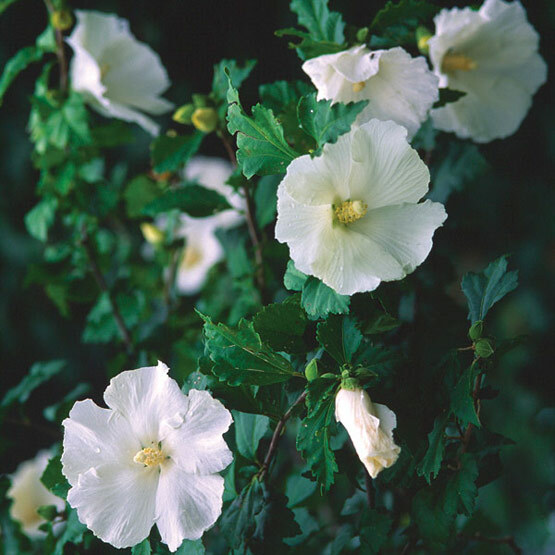 In the USA this deciduous shrub is typically called Rose of Sharon. Beware of common names, however, as in the UK and Australia ‘Rose of Sharon’ refers to an entirely different plant; Hypericum calycinum, which in turn is known as St. John’s Wort here in the USA. Confused yet? 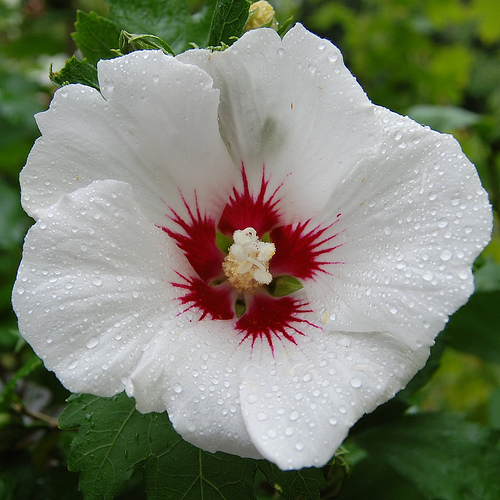 Stick to ‘hardy Hibiscus’ and you’ll do alright! Typically these old fashioned shrubs grow 6-8’ tall and 4-6’ wide and bloom best in full sun. They are undemanding, tolerate wet soil, are usually ignored by deer and attract hummingbirds. Hardy in zones 5-8 they give a restrained tropical look to temperate gardens. The heirloom variety ‘Bluebird’ offers intense blue-purple single flowers with a darker velvety eye. 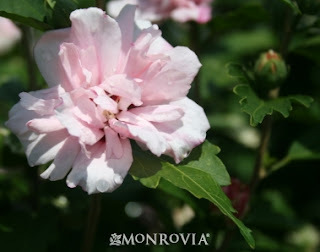 Monrovia now sells these as grafted plants which are more vigorous than those grown on their own rootstock. For a romantic combination surround ‘Bluebird’ with whirling butterflies (Gaura lindheimeri), letting the delicate white and pink flowers dance around the base of the shrub in the breeze. A real magnet for hummingbirds with its ruby red throat is the larger ‘Red heart’ variety. This 8-12’ tall shrub can get to 8’ wide so give it some room to stretch. A mass of purple fountain grass (Pennisetum setaceum ‘Rubrum’) at its feet would echo the throat color of this otherwise all-white bloom. There are several double flowered varieties including the soft pink ‘Blushing bride’ and the lilac ‘Blue Chiffon’. These have a more open blowsy look to the petals rather than the typical tubular flowers. 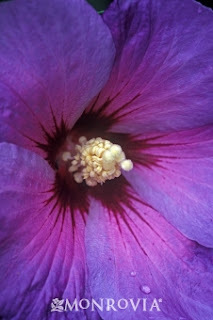 Hardy hibiscus are best placed at the back of a border where they can take over the flowering display from earlier blooming shrubs such as lilac or be used to form colorful combinations with tall, late season perennials such as ‘Gateway’ Joe Pye weed (Eupatorium purpureum). When spaced 6’ apart they can also be used as a seasonal screen or hedge. So if your late season borders need some new life consider adding height and color with this old fashioned, trouble free shrub. Hibiscus can form a backdrop to mid-sized perennials, completing a power packed vignette to end the season. I think the Hibiscus plant is so beautiful. I just seem to have trouble with these each year getting them to come back in my garden.